Bizen Kagemitsu (備前景光) was the son of Bizen Nagamitsu (備前長光) who was, in turn, the son of the founder of the Bizen Osafune School, Mitsutada (備前光忠). The works by these first three generations of smiths solidified the foundation of the Osafune School into one of the greatest schools of sword making of all time. Bizen Kagemitsu (備前景光) is called Sahyohenjo in most accounts and his dated works show that he was born in the latter part of the 13th century. We have works from him dating from the Kagen era (嘉元) (1303) through the Kenmu era (建武) (1335). While his father and teacher, Nagamitsu (長光), did not leave many tanto; Kagemitsu,(景光) on the other hand, has left us a great number of fine tanto that have survived through the years. He also made extraordinary tachi and katana. There exists one tachi and one tanto that have been designated to be National Treasures (Kokuho), and twelve tachi and one tanto that have been classified as Important Cultural Properties (Juyo Bunkazai). Finally there are ten tachi, two katana, and eight tanto that are designated to be Important Art Objects (Juyo Bijitsuhin). This is a very impressive list, indeed. Among the very few extant examples of tanto by Nagamitsu (長光) there are some that do exhibit gunome patterns very close to the kataochi (saw tooth) type. While this shows that Nagamitsu (長光) may have been the first smith to begin using a form of this kataochi gunome pattern of hamon, it was his son, Kagemitsu (景光) who made this type of temper the trademark of most of his tanto. His katana and tachi will generally also possess some kataochi gunome mixed in with patterns of choji, notare, etc. Kagemitsu (景光) was an important link in the succession of great smiths from the Osafune School (長船). We know he was the son of Nagamitsu (長光), but he was also the older brother and teacher of Kagemasa (景政). We know that there was a close relationship between these two smiths because of the fact that the works of Kagemasa (景政) closely resemble those of Kagemitsu (景光) especially in the slight bit of ashi that appears in the suguha of both smiths. Another important contemporary of Kagemitsu (景光) was Chikakage (近景). We know of the relationship between these two smiths for many reasons. First both were contemporary in time and both were students of Nagamitsu (長光). 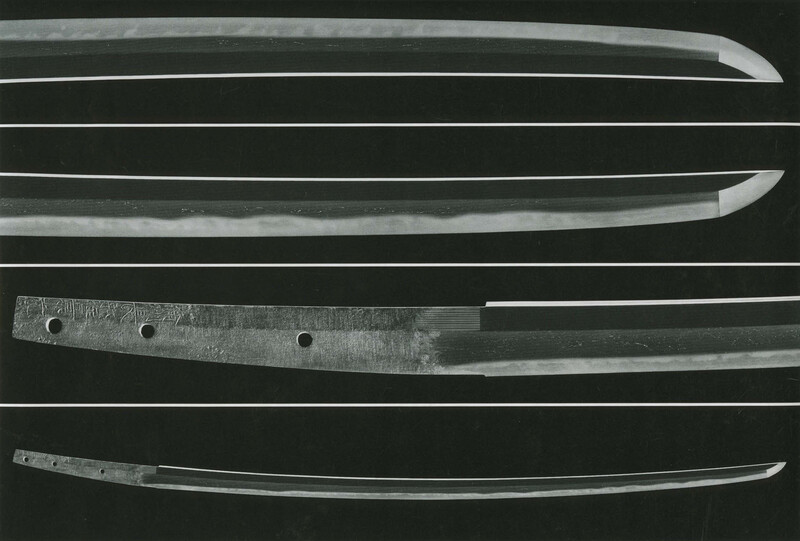 Also during the later period of Kagemitsu’s (景光) life, we find swords with an unusual signature, i.e. signed with the chisel cuts done in a reverse manner (saka-tagane). It is known that Chikakage (近景) cut this type of signature in works he substitute-signed for Kagemitsu (景光). Such a situation would only occur where there was a close working relationship. Kagemitsu (景光) also passed along his legacy to his son, Kanemitsu (兼光) who became known as O Kanemitsu (大兼光). Kanemitsu (兼光) worked well into the Nanbokucho era. Kanemitsu (兼光) went on to lead the Osafune School (長船) and influenced such well-known smiths as Tomomitsu (倫光), Yoshimitsu (義光), Hidemitsu (秀光), Motomitsu (基光), Masamitsu (政光), and Shigemitsu (重光). Sugata: In Tachi, the sugata exhibits the features characteristic of the Kamakura era. Generally blades are shinogi-zukuri, iori mune with koshi-zori. There is a marked tapering approaching the point (funbari). There will be hira-niku and the kasane is made thick. The appearance of the blade will be one of grace and elegance. Tanto will also be in a shape typical of the Kamakura era. They will be hira-zukuri with a narrow mihaba. They will exhibit uchi-zori with an iori mune. Jitetsu: The kitae is ko-itame mixed with small mokume, making a fine and beautiful grain. The ji-nie is also fine and the midare-utsuri or choji-utsuri will appear in a pronounced manner. Occasionally one with bo-utsuri will be found which is perhaps a forerunner of the bo-utsuri found in Bizen works of the Muromachi Era. Hamon: The hamon will be nioi-based, as is the case with Bizen works. Kagemitsu’s hamon will resemble that of his father, Nagamitsu, having a mixture of various kinds of choji mixed with occasional gunome. Occasionally a suguha hamon will be found. 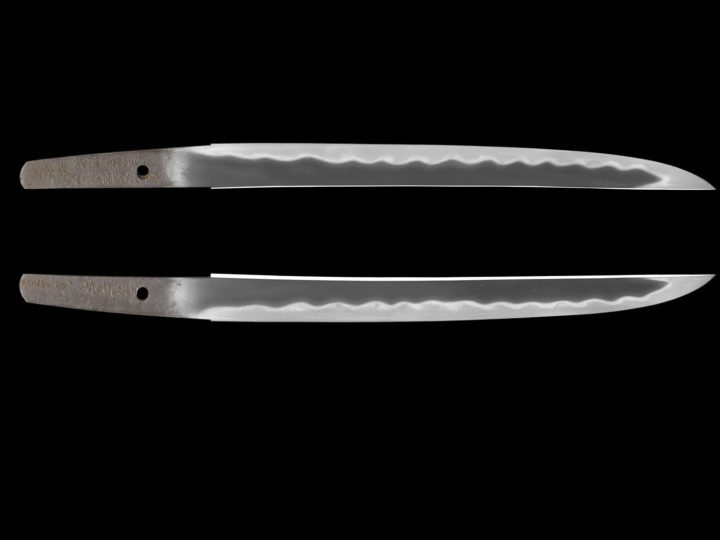 In Kagemitsu’s hamon, however, the gunome will have flatter heads and will lean toward one side like the teeth of a saw blade. This is called kataochi gunome and it is a famous trademark of this smith, especially in his tanto. Boshi: The boshi of Kagemitsu is also an important kantei point. In most cases (there are always exceptions), his tachi were known for what is called the “san-saku boshi“. This boshi is called a san-saku boshi since three swordsmiths, Nagamitsu, Kagemitsu, and Sanenaga made it. The characteristics of this type of boshi are that it is fairly straight when crossing the yokote and then it slightly undulates in the mid point ending in a maru shape with kaeri. His tanto will have a more pointed boshi with a slight kaeri. Horimono: Most of Kagemitsu’s works will have intricately made carvings of a variety of subjects. Kenmakui Ryu, Suken, Dokko Tsuki Ken, Tsume Tsuki Ken, Bonji, are found. Bo-hi are seen with the tops of the hi being pointed in nature. 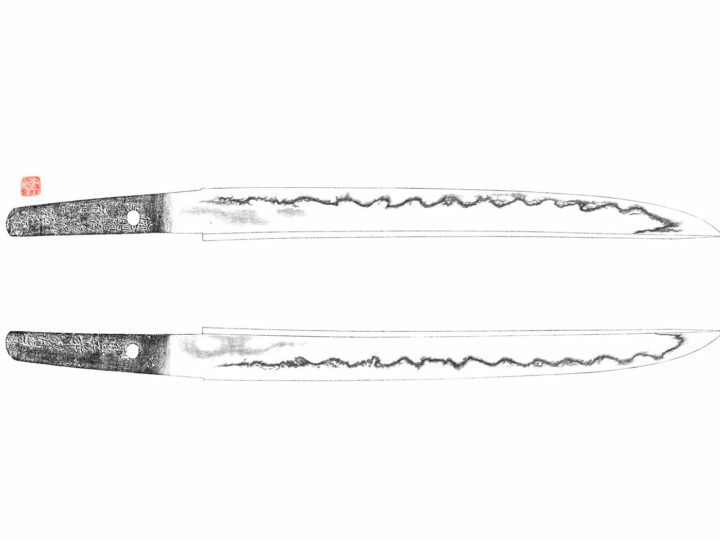 Nakago: Not many ubu blades tachi exist, but in general the nakago will be made with the tip in ha-agari-kurijiri. The yasurime will be kiri, katte-sagari, or sujikai. The shape of the nakago of the tanto will be typical of the Kamakura era without too much sori or in furisode shape. Rarely the mei will be given in two characters. Most will be a naga-mei. Kantei points: His jigane will be fine and densely forged in ko-itame with some mokume, a bluish tint, and plentiful ji-nie. This points to the Osafune group of smiths and particularly to Kagemitsu. His blades will have a san-saku boshi and his hamon will have kataochi-gunome. His tanto will be entirely of kataochi-gunome whereas those of his father, Nagamitsu, may contain some kataochi-gunome. Designated Tokubetsu-Juyo Token at the 17th Shinsa of April 24, 2002. Accompanied by an old saya. Measurements: Length: 70.2 cen. ; Curvature: 1.6 cen. ; Width at the base: 2.4 cen. ; Width at the point: 1.5 cen. ; Kissaki length: 2.3 cen. ; Nakago length: 16.3 cen. ; Nakago curvature: 0.2 cen. Construction: This is a shinogi-zukuri tachi with an iori-mune. The blade is narrow, and there is not a very conspicuous difference between the width at the base and the point. The blade is thin, and while the blade has been cut down, the curvature is still somewhat high. There is a ko-kissaki. The kitae is ko-itame hada that is very tight, and there is a mixing in of slightly flowing hada on the haki-omote. There is a slight covering in ji-nie, and the jigane contains minute chikei activity. The midare-utsuri is conspicuous, and the jigane is vivid. 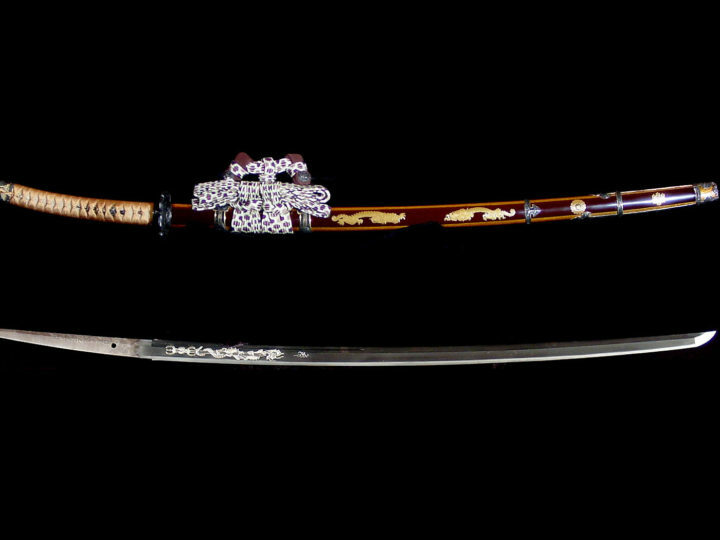 The hamon is sugu in style with a mixing in of such features as gunome, ko-gunome, squared tempering (kakubaru-ha) and ko-choji. Here and there are areas of slanted tempering. There is a great deal of ko-ashi activity with a mixing in of yo. The nioiguchi has a tight feeling and is covered in ko-nie. There are minute streaks of sunagashi, and the nioiguchi is bright and vivid. The boshi is sugu with a ko-maru and a slightly brushed tip. The nakago is suriage, and the end is kiri. The yasuri (original) are kattesagari and (new) kiri. There are three mekugi-ana, and a long signature near the mune at the end of the nakago on the haki-omote. Maker: Kagemitsu of Osafune in Bizen province. Description: Kagemitsu is the son of Nagamitsu, and is the third generation among Osafune smiths. He is highly regarded for perfecting the kataochi-gunome hamon. As for his period of activity, it extended for a period of over thirty years from Kagen (1303-1306) during the late Kamakura period to Kemmu (1334-1336) at the beginning of the Nambokucho period. His style of workmanship includes a suguha hamon with a mixing in of gunome that is slanted, and a hamon that is essentially kataochi-gunome. Although generally he has a style of workmanship that is rather more sedate than that of Nagamitsu, his kitae is very well worked and tight, and there are occasions when one comes across a blade that is superior to his father’s. Moreover, in comparison to the few tanto by Nagamitsu, there is a characteristically large number of extant tanto by Kagemitsu. Regarding this tachi, it has a kitae with a very tight ko-itame hada that is slightly covered in ji-nie. The jigane contains minute chikei activity, and the midare-utsuri is prominent. 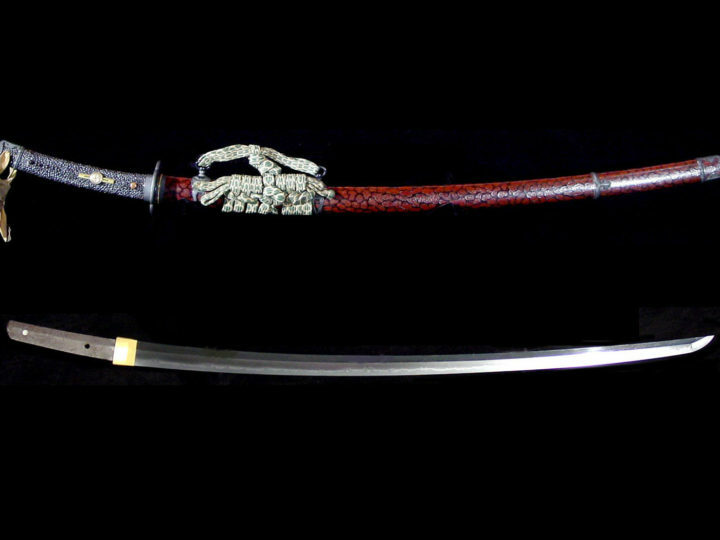 The hamon is sugu in style with a mixing in of such types of hamon as gunome, ko-gunome, kakubaru-ha and ko-choji. The nioiguchi has a tight feeling and is covered in ko-nie. There is the appearance of slanted tempering here and there. One can notice kataochi-gunome, which shows the typical style of workmanship for this smith. There is also the appearance of ko-ashi and yo. The bright and vivid features of both the ji and ha are supreme, and which clearly show the salient features of this smith. This is a masterpiece with a feeling of grace and dignity, and, moreover, it is pleasing that both the ji and the ha are healthy. Finally, it is clear that this is a sword that was handed down in the Kuroda family of Chikuzen based on the specially written history on the accompanying old saya. This beautiful tachi comes with two sets of koshirae. The first is an old koshirae with the tsuba and the saya covered in leather. This is the type of koshirae that was worn by a Samurai in battle. The second is a beautiful Itomaki no Tachi koshirae that was awarded Juyo kodogu status (important koshirae). It is beautifully lacquered with family mon and is quite breathtaking in its beauty. The tachi also comes with a second old shirasaya with the markings of the famous Kuroda family to which this tachi belonged at one time.